Hey Lovelies! We are so excited to be part of another blog hop this week! If you have been hopping along, welcome. If you are just getting here, you are in for a treat because along with this post, there are also a wonderful group of tablescape lovers that all have some Thanksgiving tablescape eye candy for you. The links to all of their lovely tablescapes are at the bottom. We love getting together with family and friends during Thanksgiving. It’s a time to get together and and really share memories, laughter and what you are thankful for. Every year we really celebrate the occasion with a lovely table sprinkled with adorable details and special touches. This year’s table is no exception! We just love this rose gold sequence tablecloth on out Thanksgiving Tablescape. We are totally loving rose gold right now and it looks great on this tablescape. 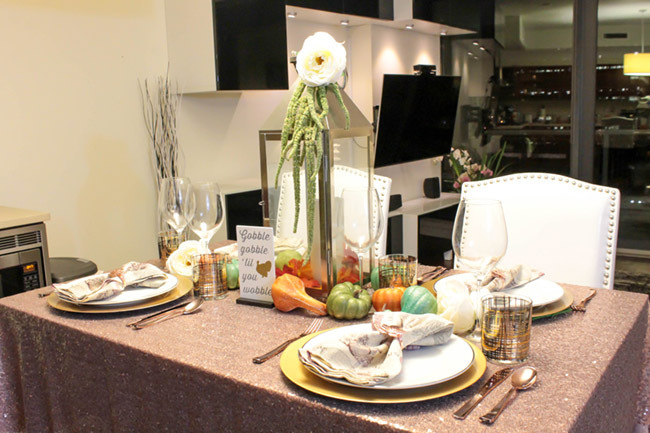 The tablecloth adds the perfect amount of shimmer to the table too. It also is a great color for fall and a totally darling color for Thanksgiving! Another detail we love on this table is this lantern centerpiece. There is just something about the statement a lantern makes on a table that we just love. We added amaranths, and topped it with a garden rose to create a really chic look. We added small gourds and pumpkins around it to really bring out the fall look and feel to the table. 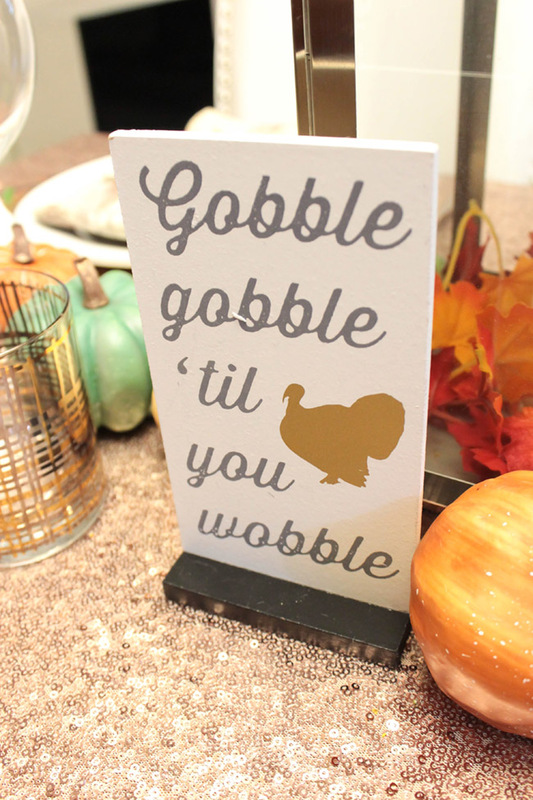 Plus this Thanksgiving sign is too darling! We always love adding a little whimsy to any table., especially when it makes people smile! We love all of the different colors of the pumpkins and the grounds. The greens and the blues hues of them are so unique and add such dimension to the table. 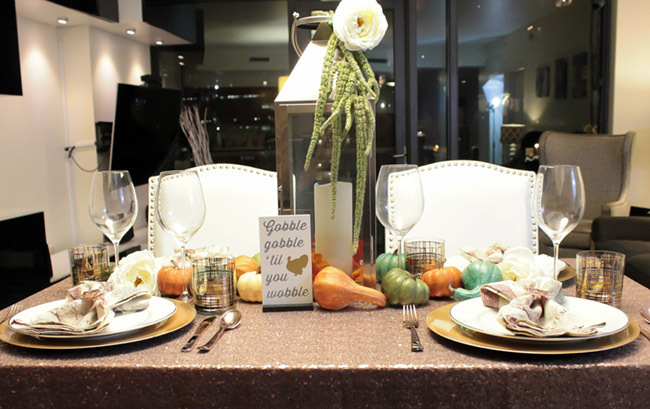 We also used rose gold copper cutlery and napkin ring to bring out the rose gold theme to our Thanksgiving tablescape! Gold pairs so well with rose gold and copper so we used a gold charger to keep in the gold color palette. There is a slight accent of platinum on the rims of the plates that adds a chic touch. 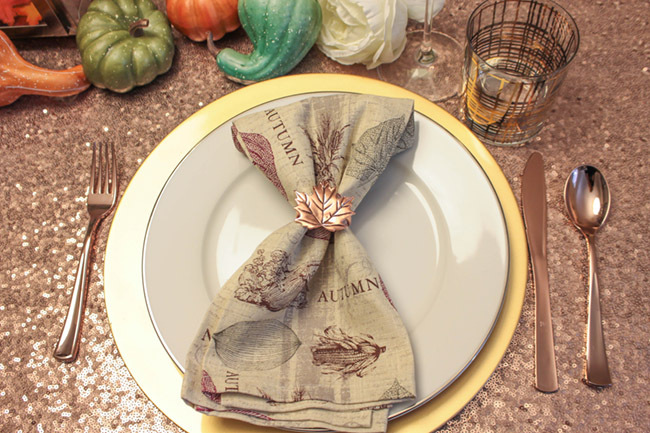 We really love these fall inspired linen napkins! They have the perfect fall details for Thanksgiving on them. The rose gold maple leaf napkin holder really ties the look all together. 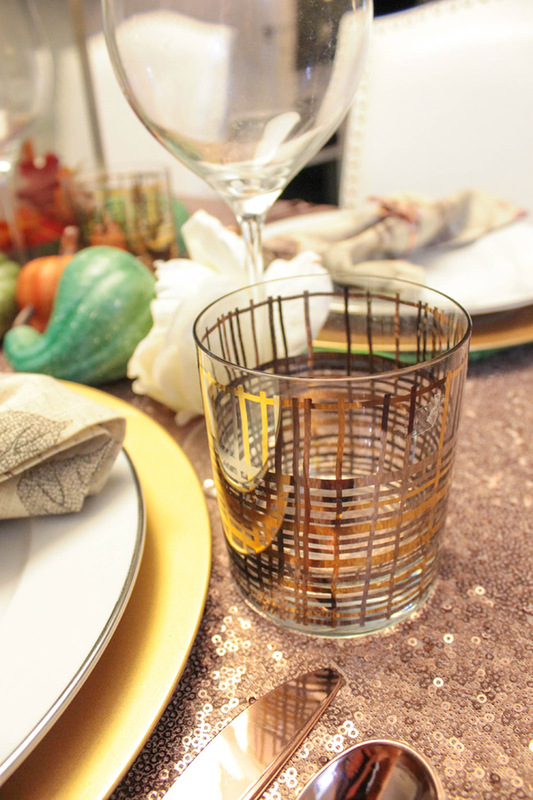 We also added these gorgeous silver and gold plaid drinking glasses at each place setting. They are a luxe touch for each guests and trusts us, you feel really special drinking out of them! With all of these chic and lovely details, the whole table really comes together beautifully! 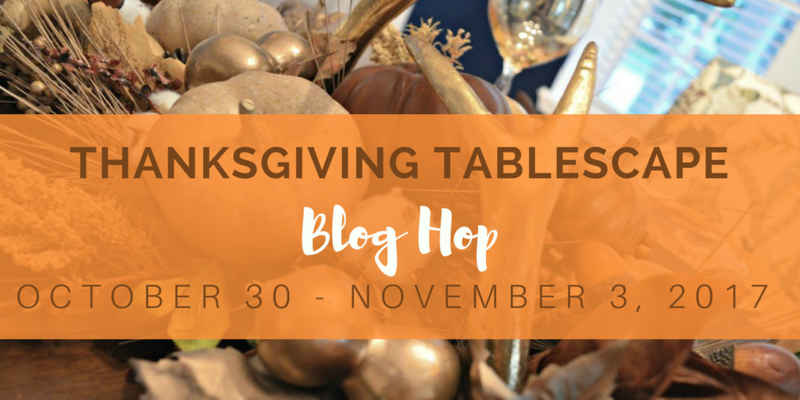 Check out all of these other great bloggers with their lovely beautiful Thanksgiving tablescapes to get tons more ideas and inspiration! I’m seeing rose gold popping up everywhere these days! Your sequin tablecloth is so festive and I love the plaid glasses! Very pretty. Thanks for being part of the hop. Your lantern makes a stately statement as your centerpiece. I love the amaranth attached. Rose gold cutlery is pretty and a tablecloth of sequins is quite elegant. Thanks, Bonnie! I love the lantern centerpiece too! Your sequined tablecloth really makes your table shine!! All those rose gold pieces coming together makes your table very on point with today’s trends! Lovely! Thanks, Ann! Love the rose gold right now. the shimmery metallics are so pretty and they elevate your table to a special occasion! The natural elements make a great contrast too and bring a welcoming element to your festive setting~ so pretty and different! Thanks, Jenna! I am really digging the metallics right now! I’m liking that rose gold flatware. SInce I’m a collector of all things vintage, it would probably take a while for that trend to go vintage, so I may just need to add some to my tablescaping arsenal soon, lol. Cheers to a festive table season, Emily! I did smile at your wobble sign so mission accomplished! I have enjoyed rose gold items also and your tablecloth is beautiful. A very pretty table, nicely done. Thanks, Kari! Glad I could make you smile! A gorgeous table, capturing the essence of the holiday, with the lantern and pumpkin centerpiece, and the fun “Gobble, Gobble” sign–so true for this feast day! Your rose motif is brilliant. I would love to sit down to this elegant table. It was a pleasure to play with you this week! Thanks so much! It was great seeing your table as well! 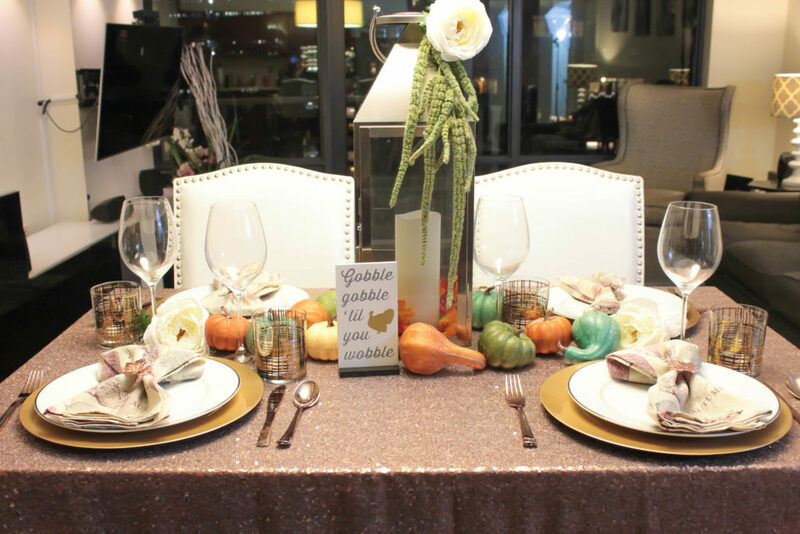 What a fabulous party inspired Thanksgiving tablescape. 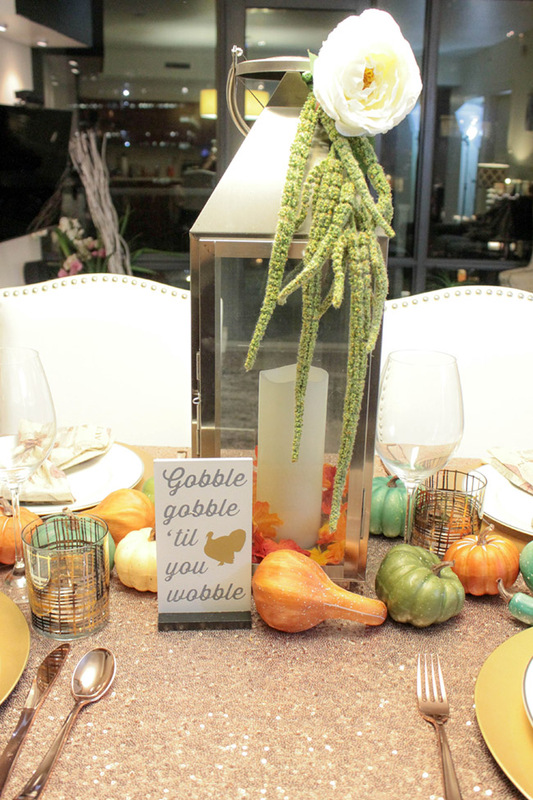 I love the sequence table cloth, and the glitter on the colorful pumpkins and gourds, The shiny copper colored napkin rings tied in a traditional element, and I really love the gold embellished glassware. The look creates a fun and fabulous atmosphere, great job! I am thankful to have you as part of my tablescape blogging tribe. Thanks, Chloe! It has been great to blog hop with everyone! I love being part of the blogging tribe. The rose gold tablecloth is awesome! 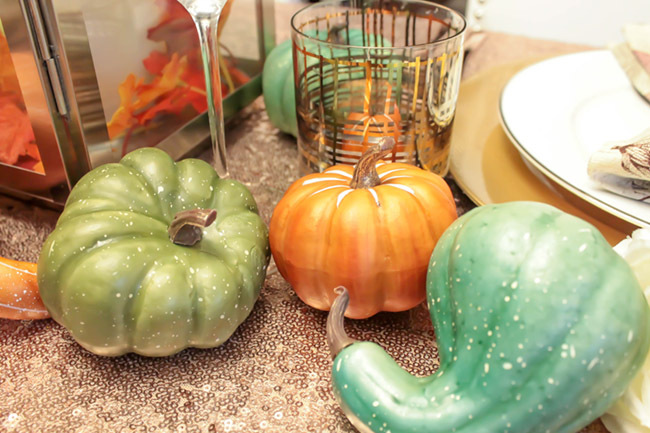 It really adds bling to the table, and I love the colors you used to paint your pumpkins and gourds. Everything looks lovely together. It’s so good meeting you through this blog hop! Thanks, Carol! The gourds add a nice touch! Very pretty table with the rose gold. it seems to be quite popular this year. Love the glitzy tablecloth. Shiny copper is a lovely look. A lovely table to celebrate Thanksgiving. That Gobble Gobble sign is the cutest! Thanks, Linda! The Gobble gobble sign is my favorite! I’ve never seen rose gold flatware before and I’m liking it – great choice for your table and you are right, it goes so well with gold and copper. That lantern is beautiful – such a statement piece and I like how you’ve arranged the pumpkins and gourds around it. 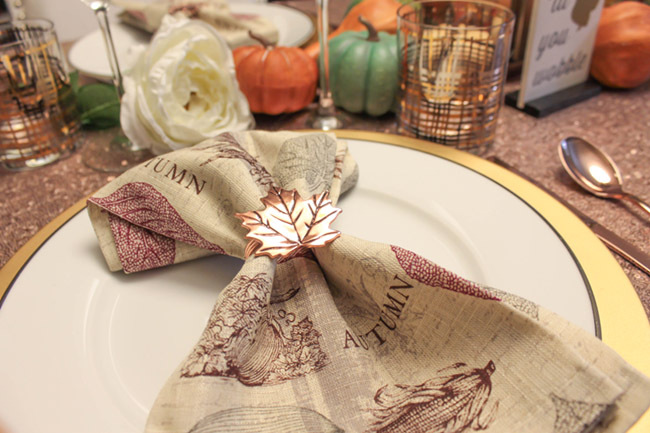 Those fall napkins are so pretty especially with the cute napkin rings. Terrific tablescape! Oh my gosh the tablecloth is gorgeous! I hope rose gold trends for a long time. It lends elegance to this table especially combined with the flatware. I would feel special sitting at this table and more so drinking from those glasses. Beautiful styling and I’m looking forward to blog hopping with you again. Rose gold is definitely chic! The sequin tablecloth is really pretty and your la;tern makes a nice statement as your centerpiece! I enjoyed blog hopping with you this week! Thanks Pam! I have enjoyed blog hopping with you too! Your Thanksgiving table is just beautiful! I love your pretty tablecloth. It has been so much fun blog hopping with you! Thanks Shannon! It has been great blog hipping with you too! 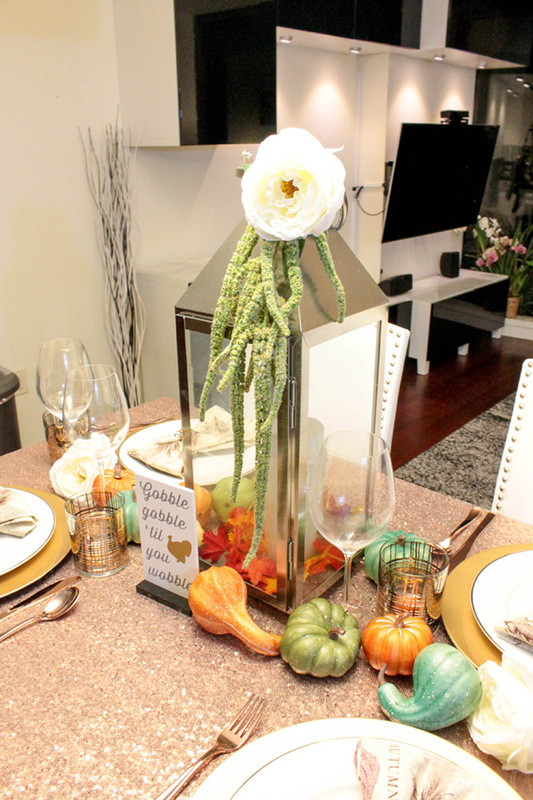 Rose gold is a perfect shade for an autumn tablescape! Love your sparkling tablecloth, it was a pleasure to blog hop with you! Thanks Donna! It has been great blog hopping with you too! That tablecloth is the star!! It is so beautiful and your entire table looks so elegant. I love the rose gold color for Thanksgiving.